SQL databases have offered triggers for years, making it easy to validate and check data, maintain integrity constraints, create compute columns, and more. Why should SQL tables have all the fun…let’s do the equivalent for NoSQL data! Our first goal is to identify and report invalid social security numbers. We’ll accept two formats: 9 digits (e.g., 123456789) and 11 digits (e.g., 123-45-6789). Anything else is an error and will generate an SNS message which, for the purposes of this demo, we’ll use to send an email report of the problem. For our example we’ll use just two fields: Name and SocialSecurityNumber (the primary hash key and primary range key, respectively, both represented as strings). In a more realistic setting you’d typically have additional customer-specific information keyed off these fields. You can accept the default capacity settings and you don’t need any secondary indices. You do need to turn on streams in order to be able to send updates to your AWS Lambda function (we’ll get to that in a minute). 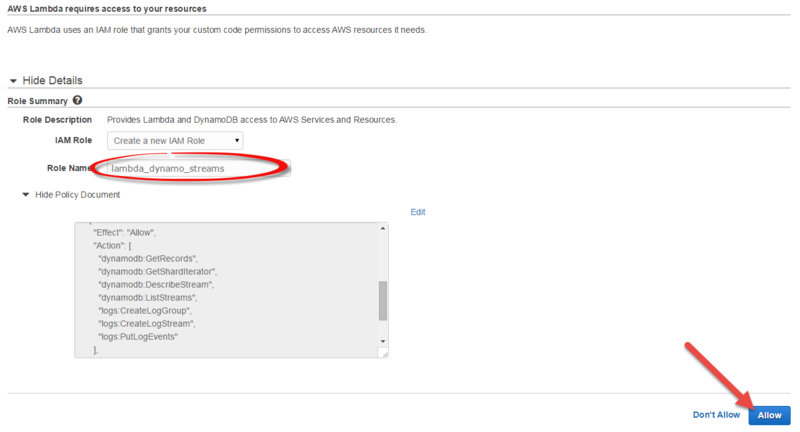 You can read more about configuring and using DynamoDB streams in the DynamoDB developer guide. To give us a way to report errors, we’ll create an SNS topic; I’m calling mine, “BadSSNNumbers”. Ok, we have a database and a notification system…now we need a compute service! 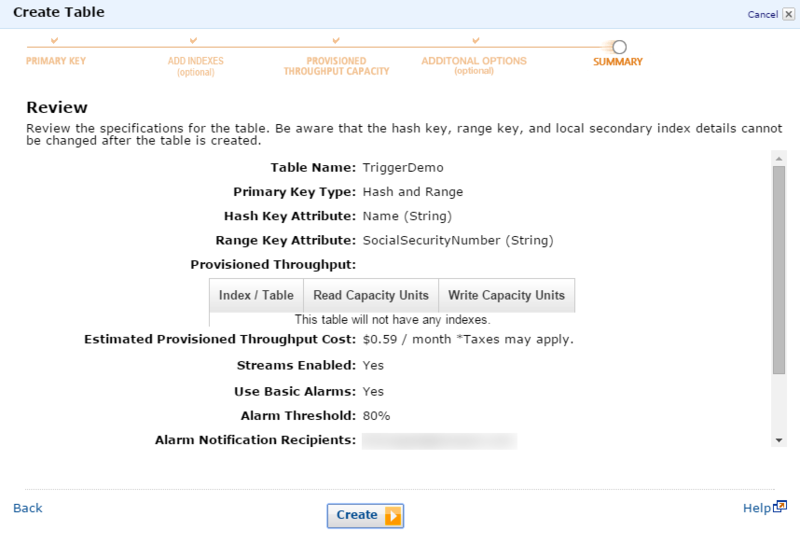 Now we’ll create an AWS Lambda function that will respond to DynamoDB updates by verifying the integrity of each social security number, using the SNS topic we just created to notify us of any problematic entries. 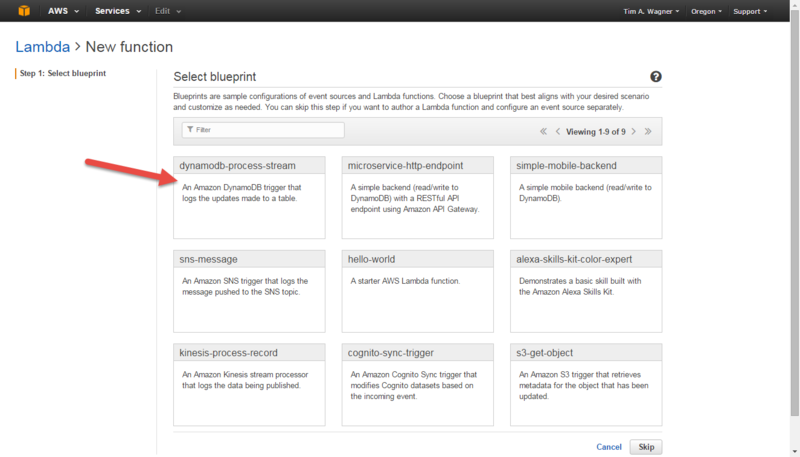 First, create a new Lambda function by selecting the “dynamodb-process-stream” blueprint. Blueprints help you get started quickly with common tasks. // Social security numbers must be in one of two forms: nnn-nn-nnnn or nnnnnnnnn. So in a few lines of Lambda function code we implemented a scalable, serverless NoSQL trigger capable of auditing every change to a DynamoDB table and reporting any errors it detects. You can use similar techniques to validate other data types, aggregate or mark suspected errors instead of reporting them via SNS, and so forth. In the previous section we audited the data. Now we’re going to take it a step further and have the trigger also maintain a computed column that describes the format of the social security number. The computed attribute can have one of three values: 9 (meaning, “The social security number in this row is valid and is a 9-digit format”), 11, or “INVALID”. 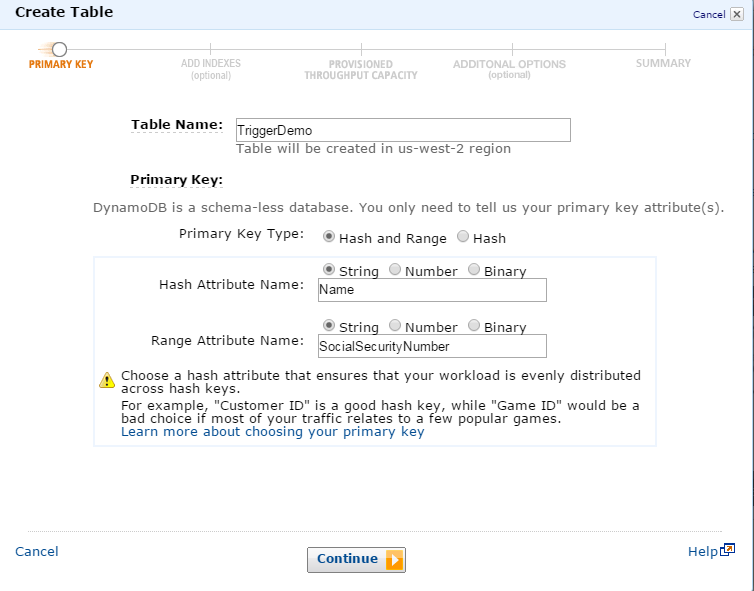 Now you can go to the DynamoDB console to add more rows to your table to watch your trigger both check and your entries and maintain a computed format column for them. 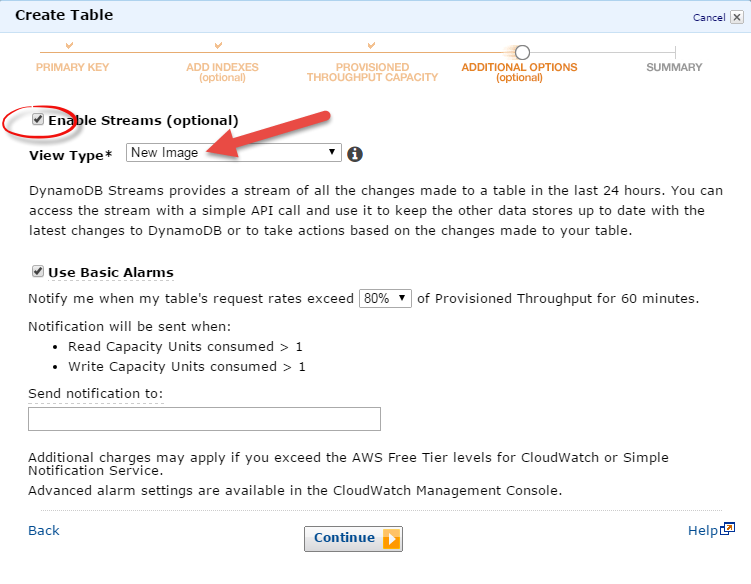 Don’t forget to refresh the DynamoDB table browse view to see the updates! I chose to leave the original data unchanged in this example, but you could also use the trigger to transform the original values instead – for example, choosing the 11-digit format as the canonical one and then converting any 9-digit values into their 11-digit equivalents. Until next time, happy Lambda (and database trigger) coding!